I have been cramming my spring break week about as full as can be. I've had three breakfasts with friends (including one three hours long! ), three friend-lunches, two friend-dinners, untold walks with our little dog, Tank, plus hours galore cuddling my sweet grandbaby. I've also seen four movies: The Imitation Game, The Red Balloon, Into the Woods, and Whiplash. Well, the first half of Whiplash. I hated it so much I had to turn it off after an hour or so. I was stunned to find that many friends of mine loved it. Here is why I didn't. The film depicts the relationship between an ambitious young jazz drummer at a prestigious music conservatory and one of his teachers, who hurls endless bigoted, homophobic, cruel abuse at his students (as well as slapping them repeatedly in the face) to get them to achieve musical greatness. I turned it off in part because I have only another forty or fifty years to live and I don't want to spend precious minutes of what time I have left in the company of anyone, real or fictitious, who treats another human being the way the J. K. Simmons character treats his students in the film. But I also turned it off because it is deeply false to suggest that artistic greatness is achieved in this way, that students who live in constant, abject terror of a teacher's physical, mental, and emotional abuse grow into their best creative selves. Any writer knows that the way to write the best stories is NOT to write with a constant critical voice harping in your head, but to silence that voice and listen instead to the voices of your characters, voices you can't hear if you are already imagining the savage response you'll get from editors or reviewers. Any actor knows that the way to produce an immortal performance is NOT to act with half of your brain focused on the tyranny of the director, but to become your character as fully as possible, to be that person, not the person of an actor who is cowering in fear of a director's disapproval. Any musician aims at becoming one with the music, inhabiting the work so completely that you leave behind any thought of what anybody else thinks, past, present, or future. The student musicians in Whiplash look stiff and terrified as they play. They follow every single commandment of their conductor with slavish obedience. They radiate no joy in the music. They never make the music their own. It is, always and forever, his. But, folks, this is jazz we're talking about. Jazz! An art form where improvisation is absolutely central. An art form that values collaboration between musicians who will jam together for hours in the sheer delight of making music with their friends. An art form that values play. I'm the mother of a jazz musician who is right now playing at the Monterey Jazz Festival in California. I have attended so many jazz performances in my life. And I am here to report that it don't mean a thing if it ain't got that swing. A swing that has some joy in it. The jazz community has repudiated the film, to my great relief, according to articles in The New Yorker, The New York Times, and Downbeat Magazine, claiming that it misrepresents jazz music, jazz pedagogy, and jazz history (including the famous incident when a fellow musician threw a cymbal at emerging jazz great Charlie Parker). I'm here to claim that it also misrepresents everything I know about how great art is made. I'll stick with the poet John Masefield, who wrote, "Great art does not proceed from great criticism, but from great encouragement." I'll add, and from great joy. I'm home on spring break for ten whole days of glorious Colorado sunshine, grandbaby-cuddling, dog-walking, cat-brushing, and catching up with as many dear friends as possible, including get-togethers with both of my writing groups: breakfast with my old group of twenty-plus years, dinner with the new group I joined this past fall. The new writing group is consumed these days with celebration for the June 2 publication date of the debut novel Book Scavenger by one of our members, Jennifer Chambliss Bertman. The book is amazing. Here's the review of it I posed on Goodreads after reading the ARC (Advanced Reader Copy): How I adored this book! It’s a page-turning thriller, a valentine to the storied city of San Francisco, an exploration of the nature of friendship and family, a feast for puzzle aficionados and code breakers, and a celebration of the community of book lovers everywhere. 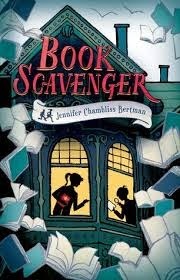 The reader’s only regret is going to be that the Book Scavenger game Bertmann has created doesn’t exist in real life, so that we could join Emily and James in playing it. Bertmann’s debut novel establishes her as a major new voice in middle grade fiction. Prediction: Book Scavenger will become a beloved classic in the mode of The Westing Game and The Egypt Game. It’s off the charts wonderful. 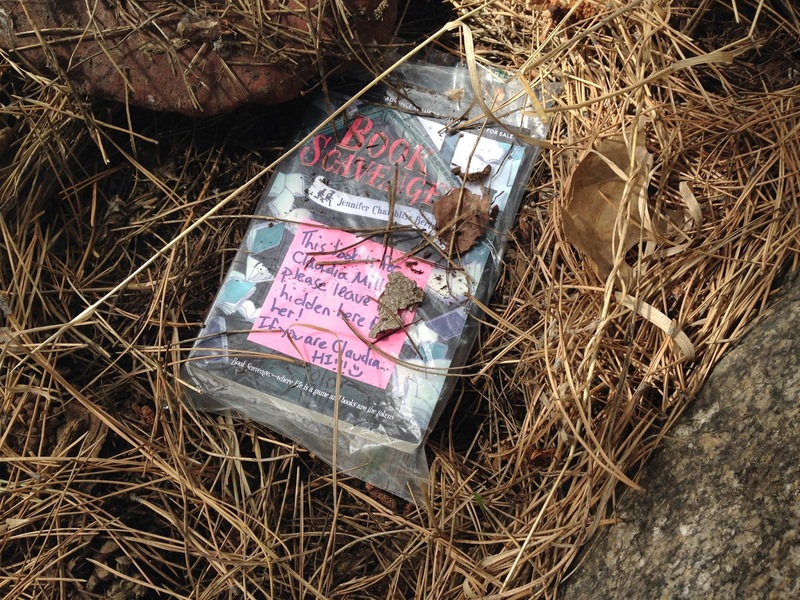 The book is based around the idea of a fictitious game where players hide copies of books all over the country and the world for other book-lovers to find, via cryptic clues posted on the Book Scavengers website. And the game now does exist on real life, thanks to Jen's website, with copies of the ARC hidden in all fifty states. And our writing group is playing the game ourselves, hiding copies of Jenn's book all over Boulder for each other to find. It is hidden! 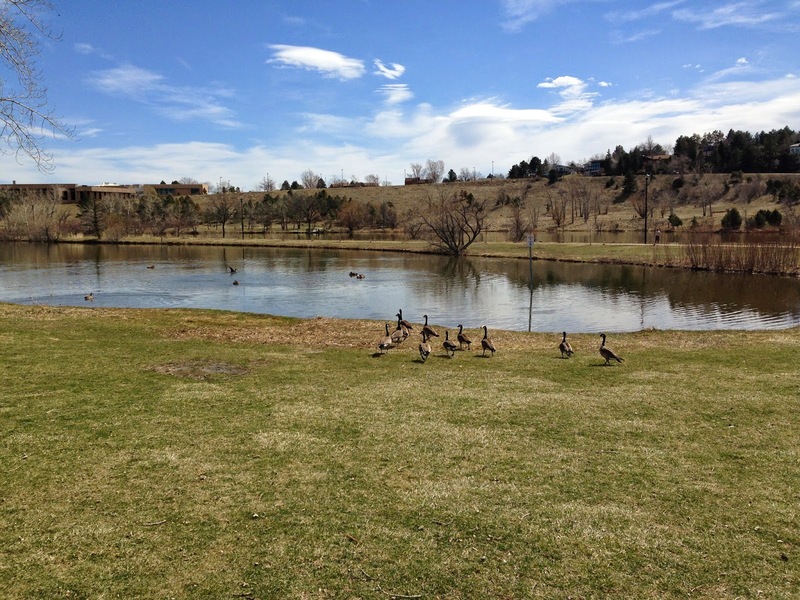 Start at Viele Lake. 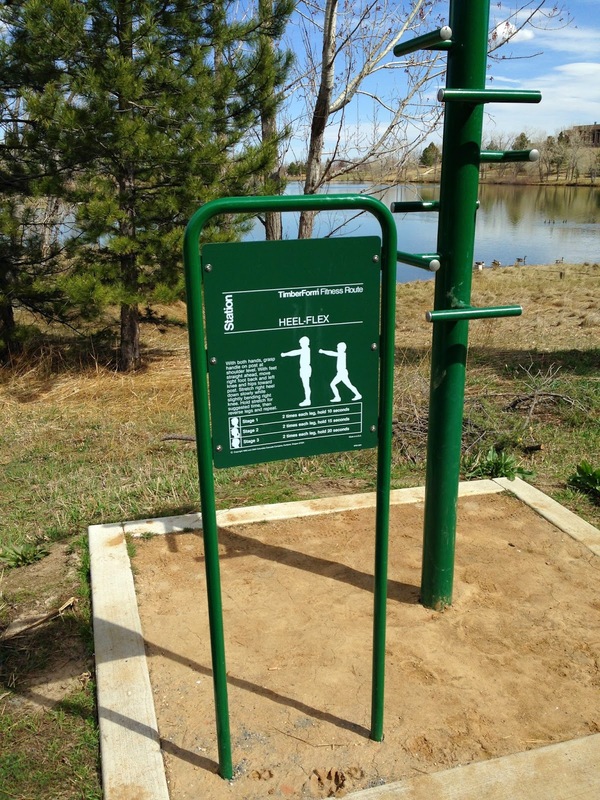 Take a walk to the southern part of the lake, until you get to the fitness sign about the heel flex. Turn your back to that sign. Then try to decode my cipher. 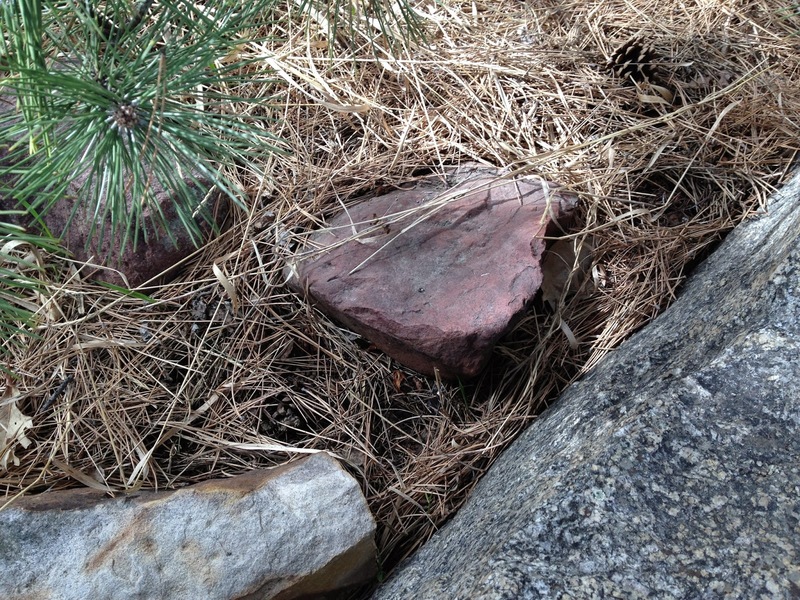 I turned around as directed and looked behind trees and rocks, hoping I could find it without having to wrestle with decoding the message, as I'm completely terrible at cyphers and codes. No luck. But fortunately, my church has a VERY brainy congregation. Upon arriving I handed the cypher to two of the most brilliant members; both solved it during the sermon. I won't give the solution here in case you want to try to decode it yourselves. 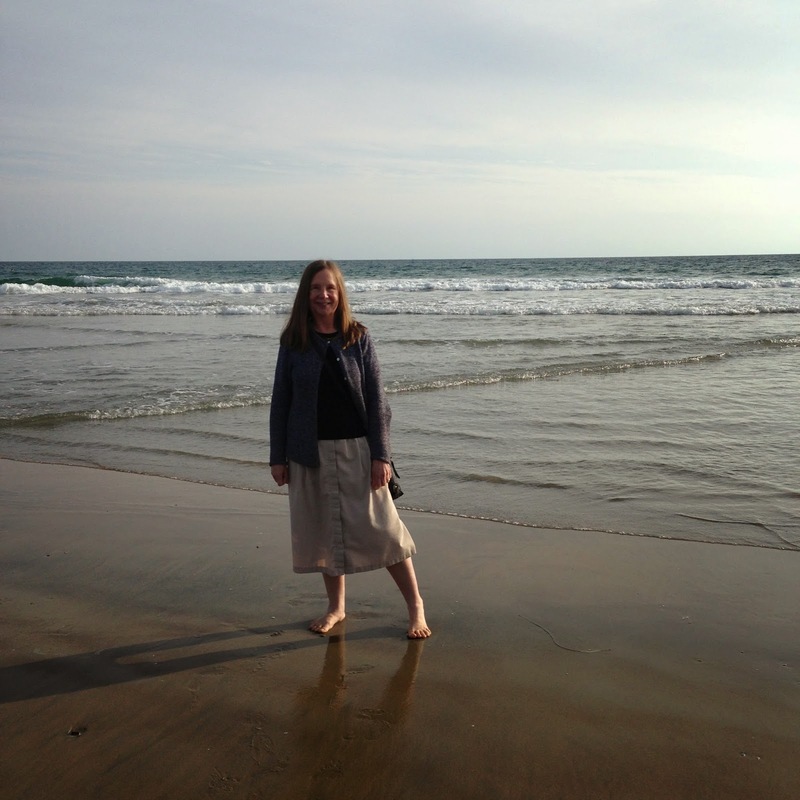 I headed back to the lake after worship. This time I found the correct spot. The picture is pretty dark and terrible, because I'm a challenged photographer, but let the poor quality just add to the mystery. Now it's my turn to hide it for Vanessa. 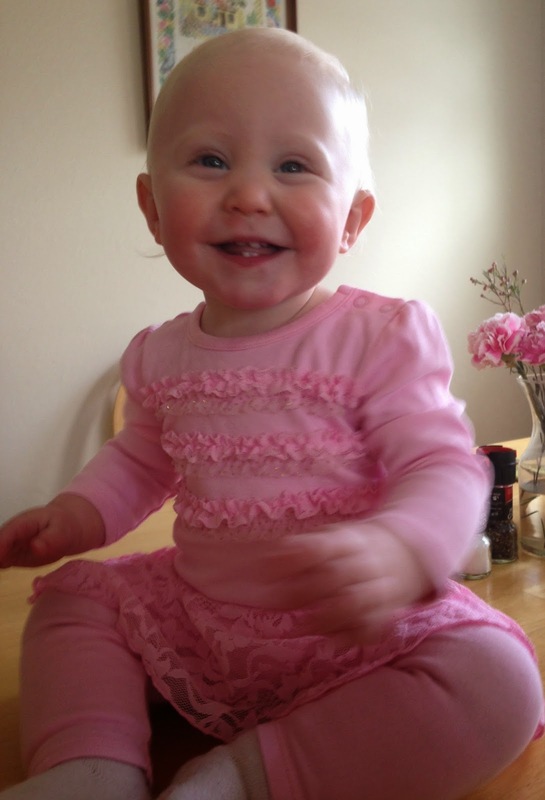 I hope she's better at code-breaking than I am, or that she has similarly brainy friends. Verdict on spring break so far: tons of fun. This past week I hosted a Symposium on Race and Children's Literature at DePauw, funded by the generosity of the Prindle Institute for Ethics. I organized the event last fall before I realized that our campus would be devoting significant time and resources to engaging in a dialogue about racial issues in our own community, and before a racist joke at the National Book Awards ceremony had the unintended result of raising awareness of the need for more diverse books. (MC Daniel Handler, after presenting African-American author Jacqueline Woodson with the award for Young People's Literature for her beautiful memoir-in-verse Brown Girl Dreaming, made a joke about Woodson's allergy to watermelon, which prompted a huge social media outcry and led to Handler's making a a compensatory contribution to the We Need Diverse Books campaign.). My symposium was a day crammed full of wonderful events highlighting my guest speakers, Prof. Philip Nel of Kansas State University (author of Crockett Johnson and Ruth Krauss: How an Unlikely Couple Found Love, Dodged the FBI, and Transformed Children's Literature and Dr. Seuss: American Icon) and Prof. Michelle H. Martin of the University of South Carolina (author of Brown Gold: Milestones of African-American Children’s Picture Books, 1845-2002). In the morning, they taught my 90-minute class on children's literature, generating a lively discussion on the question: "What is African-American children's literature?" (Possible answers: literature by African-American authors, literature about African-American characters, literature for an African-American audience of readers). Some students worried about the whole project of labeling any category of literature in this way: is this exclusionary? But if we don't pay attention to such categories, we end up with what we have now, a publishing industry in which at best 10 percent of children's books published each year are written by diverse authors or feature diverse characters, when 40 percent of American children identify as African American, Native American, Asian American, or Latino. Each speaker gave a well-attended talk. At 4:15 Phil presented "Was the Cat in the Hat Black? : Structures of Racism in Children’s Literature,”which looked at the complexity of Seuss's portrayal of the famous cat and its racist antecedents in black-face minstrel shows. His point was not to get us to repudiate this beloved text, but to see what problematic cultural sources continue to haunt the books we give our children. At 7:30 Michelle presented "From the Kitchen to the Edges: Hair Representations in African American Children's Picture Books," a look at the political power of children's books to empower young readers to celebrate themselves, their racial and cultural identity - and their hair. The day also included a luncheon panel where Mollie Beaumont, our Putnam County Public Library children's librarian, joined us to reflect in a more informal setting on the need for diversity in children's books. In my five-minute panel presentation, I reflected on my hesitation as a white author to write outside of my own ethnicity/culture/race. After all, my first fifteen books were all about girls; it was only when I became the mother of my two sons that I felt confident enough to write about boys. But even as I haven't focused on race in creating the characters in my children's books, leaving physical appearance largely undescribed, I've more than once had occasion to realize that I've created a non-white character - when I saw the illustrations for the book. Unlike authors, illustrators are unable to leave race, or at least racial appearance, unspecified. The children in my picture book A Visit to Amy-Claire, illustrated by Sheila Hamanaka, appear as Asian-American. Perfect neighbor boy Ryan Mason in the Gus and Grandpa series is black, thanks to illustrator Catherine Stock. And in my current Franklin School Friends series, Izzy, title character of Izzy Barr, Running Star (out next month) is also black, thanks to illustrator Rob Shepperson. So in 2015, one of the all-too-few children's books featuring African-American characters will be by me. 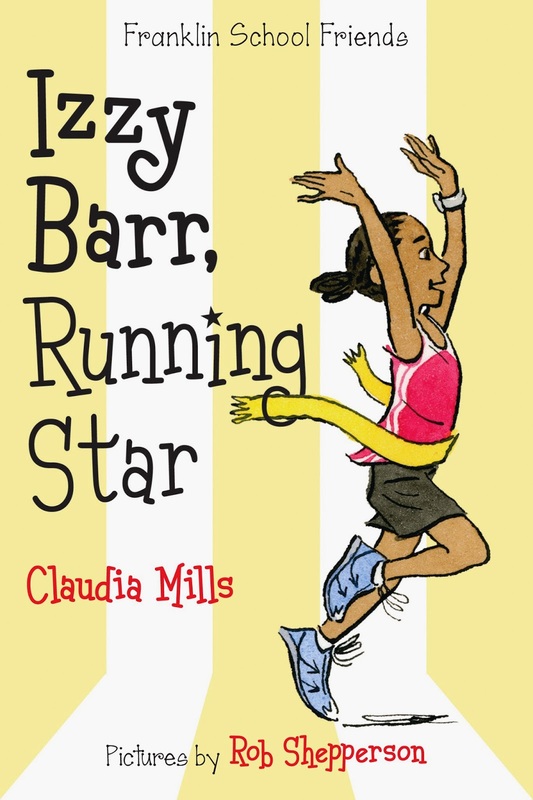 I do have a twinge of worry that it's my running star who is African-American rather than my reading queen (Kelsey Green, Reading Queen) or math whiz (Annika Riz, Math Whiz). Have I perpetuated stereotypes of African-Americans succeeding in sports rather than in academics? Well, but Ryan Mason in Gus and Grandpa succeeds in everything, and Amy-Claire's story isn't built around any desire for success in any dimension. Right now, my tentative conclusion is that preoccupation with avoiding any conceivable stereotype leads to paralysis, and to a reluctance on the part of white authors and illustrators to engage with diversity at all. What's important is that non-white children get to see themselves mirrored in the books they read, and that white children don't get a steady diet of images that allow them to think the world belongs to them alone. Right now, what we need is diverse books written and illustrated as well and beautifully as we can make them. We need to see all kinds of kids, all colors of kids, succeeding and failing and laughing and crying and growing and changing in all kinds of ways. Thanks to the Prindle Institute, and to Phil Nel, Michelle H. Martin, and Mollie Beaumont, and to my terrific students and the larger Depauw community, for making this Symposium on Race and Children's Literature such a success. In my senior year at North Plainfield High School, our "accelerated" English class was taught by the formidable Miss O'Brien. She gave us a "Great Books" curriculum: it was there that I first read John Stuart Mill's On Liberty and knew I wanted to major in philosophy in college. She taught us how to write the five-paragraph essay with the thesis statement in the last sentence of the first paragraph. She drilled us in rules of grammar. The one I still chant to myself is "One, of phrase, relative pronoun, plural agreement." In one class, I don't remember the particular topic, I made an impassioned speech against compromise (these were the politically turbulent early 70s): I would never compromise on anything I believed in, ever, ever, EVER! As a result, Miss O'Brien gave me Sophocles' tragedy Antigone to read, in the adaptation by Jean Anouilh. In the play, Antigone, the daughter of deposed King Oedipus, defies her royal uncle Creon's edict to leave her dead brother Polynices unburied. Antigone refuses to compromise. Creon refuses to compromise. By the end of the play many characters, including Antigone herself, are dead. I loved the play, though it did not make me any more inclined to compromise. Instead, at age seventeen, it made me yearn to be a tragic heroine. Even more than loving the play itself, I loved that Miss O'Brien gave it to me, that a teacher would think an ancient tragedy could be relevant to a 20th-century schoolgirl's life and way of being in the world. At DePauw this spring, I'm in a reading group on Antigone. 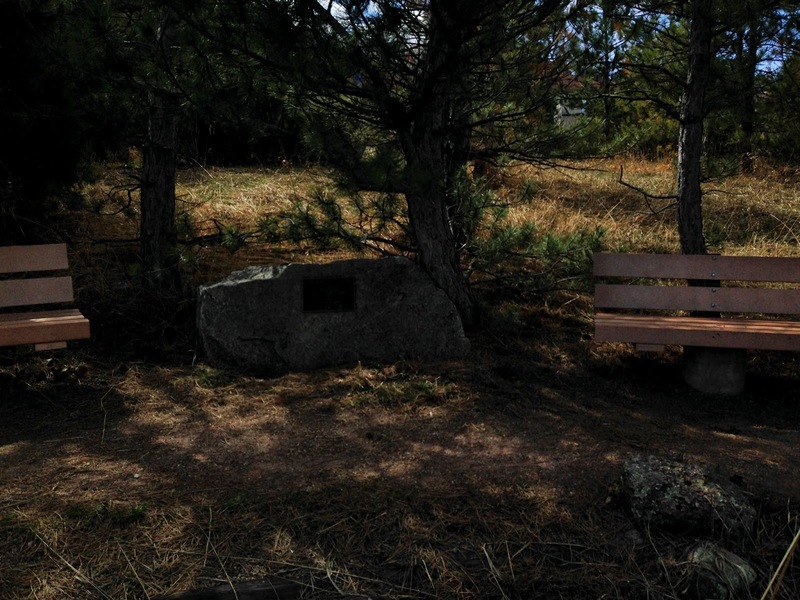 The Prindle Institute for Ethics sponsors a number of reading groups each semester. Some faculty member proposes a book on which he or she would like to lead a discussion. The Prindle purchases the books and the lovely snacks. Then the group members meet together for a period or weeks or months to discuss the book, over wine and cheese, by the Prindle fireplace. I just finished leading my own group on philosopher Susan Wolf's book Meaning in Life and Why It Matters. Now I'm in the group on Antigone, led by Keith Nightenhelser, who also happens to be my dearest friend from graduate school. This group is erudite and intellectual beyond anything my youthful self every could have imagined. We've read Judith Butler's book Antigone's Claim: Kinship between Life and Death. Now we're on to Bonnie Honig's fabulous book Antigone, Interrupted. Both authors continue what I now know is a long tradition of thinking that the play is relevant to our way of being in the world. Hegel's famous reading of the play is as a dialogue between the opposing claims of sovereignty (Creon) and kinship (Antigone), the state and the family, the public and the private. Butler complicates this view considerably: Antigone, as the child of an incestuous union (her father, after all, was Oedipus, who unwittingly killed his own father and married his own mother), is hardly positioned to defend traditional family values. Honig focuses on "interruptions" in the play: which characters interrupt other characters, and why, and what does this say about the balance of power among them? She interprets Antigone not as crazed with lamentation for her dead brother, but as a political actor, committed as strongly to life as to death. At my second meeting with the group last night, I loved thinking how happy Miss O'Brien would have been to have eavesdropped on our discussion. Oh, and how happy she would be that I could spot the error in the first sentence of Honig's first chapter: "I am one of those people who finishes other people's sentences." NO! One, of phrase, relative pronoun, plural agreement: "I am one of those people who finish other people's sentences." And how happy she would be that now I compromise all the time, probably too much, a result of all that has happened to me over the intervening forty-three years: wonderful things, terrible things, transformative things, things that make me much less willing to stake my life on any absolute. The reading of Antigone has been a beautiful gift to me, then and now. I think of this whenever I have a busy, fraught schedule. Right now my busy fraughtness is around a series of trips. I'm toward the beginning of six straight weekends of travel. Next weekend: speaking at a children's literature festival in Tampa. The following weekend: speaking at the children's lit festival I attend every year in Warrensburg, Missouri, the one where we all buy shoes at the old-timey shoe store downtown. The following two weekends: to Colorado for spring break and back to Indiana again. That is a lot of travel, especially in this snowy winter, especially when two of the trips involve connecting flights. I added up all the flights: 14. The odds become very good there will be a snafu for at least one of them, wouldn't you say? I now have five of the flights done: two from Indy to California, two back to Indy from California, and one home to Colorado. I had one minor snafu. The Indy-Chicago leg of my trip out to California was delayed for some kind of "VIP hold" on incoming flights (the president? ), so I missed the last flight of the day to Santa Ana (Orange County), but luckily I was able to fly to Los Angeles that evening instead, and take an hour-long-shuttle to the hotel, so all I really missed was two hours of sleep and didn't miss any fun at all. So I can say, of my intense travel schedule this spring: "All right, so far!" I'm hoping the travel gods will think that the delay on the Indy-Chicago flight counts for my mandatory snafu, even though it was barely a hiccup. If not, here's to handling all future travel travails with the optimist's cheer.